I have been doing drawings for my journal. I’ve been drawing humans mostly and animals – just like tigers, lions – the lions I copied by a snowflake that Mariah did. She made a mistake snowflake and it turned out to be a lion for me! I copied it by drawing. This is a portrait of Mom, Makayla, Mariah and me. I just watned to do a portrait for mom. It took one day. It took me a while because I lost the pencils I was working with (giggle!). I like that I did framing. My second one, yup, is a kind of a person. I designed in on my own. It’s a bad guy girl. I kind of did this (made a triangle on his forehead) to make him look bad. It kind of looks like Daedelus (inventor from Percy Jackson). What I like about it is the bad guy triangle. This week I made some clay charms with my grandma. I had so much fun molding the charms into little animals or into smiley food. The first charm I made was an octopus with a top hat and a mustashe. .1.roll five balls, one big ball, four small. .6. then you shape the X into eight arms. I felt so happy when we were doing the charms. I made ten charms my favorite was the flying pig. the flying pig was really fun to make because it was fun to have some imagination and to create a flying animal that does not usually fly. I also made a multi colored fish and chameleon. For the first day of school mom bought us a kit to make clay charms! Mariah and i have been dying to make them so finally mom said why dont you do your clay charms with grandmak so we asked grandmak would do are clay charms with us!!!! She of course said yes... if she didn't i would not be writing about it! I was really excited because i had been looking forward to it! Next step is to stick a charm hanger in it. I would suggest you would bunch up the clay around the charm hanger!!! The third step is to make sure your oven is the right temature. Then you put the clay charms in the oven and wait for 15 minets I think! While I was making the charms I felt calm and frustrated!?! I felt calm because I LOVE to play with clay!!!!!!!!!! Why i felt frustrated was because I didn't like the feeling of clay under my nails!!!!!! this week I have been playing a wii video game called lego indiana jones. Mom said this video game would help us with our math. I thought that was almost the coolest thing she ever said. If you would like to comment please comment ! Over the Christmas holidays I lost a tooth - on Christmas Eve. And then on the day after boxing day, I lost another one! 'Cause the second one had to come out because it was sideways. I like that I put my tooth in a container under my pillow. I like that I can see my tooth when it falls out. And I can see my new teeth come in. I like that the Tooth Fairy brings me money. I don't like that it hurts losing it. My next teeth that are wiggly are my top two front teeth. I'm working on them! Over the Christmas holidays I painted two paintings for my relatives who bought them! It was surprising how little work that had to be done on a small painting compared to the big ones! While making the paintings I felt excited to see how they would turn out and kinda frustrated?!? 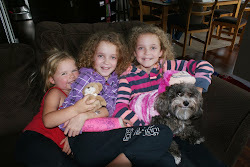 We had to be very patient with each other!!! Which was because we each had our share of different ideas! My favorite part was seeing how they turned out and giving my relatives the paintings! The South Shore Gallery is a really nice and awesome place – I was just in it the other day. It was my first time being in there. 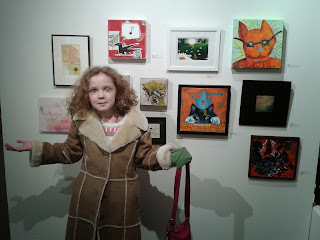 I really liked all the art that was for sale. The gallery was even more astonishing. How people made fabric art – you could add just a dot of fabric and it was considered fabric art. But if you had no fabric then it wouldn’t be counted as a fabric art. I liked that we knew an artist who was in the show because it was like a search and find – cause I got to look for her art – her name is Phyllis Lysionek. I really liked these fabric flowers that you could pin anywhere you wanted. I also liked pin cushions. I really liked this owl fabric picture – it was a landscape with an owl hunting. It was cool. I was inspired to make some fabric arts – in fact, I am working on a fabric art piece – I am making a picture of an owl out of different fabrics and I will sew them together. My grandma K is helping me with this on Mondays. At the gallery I felt inspired, excited and calm. 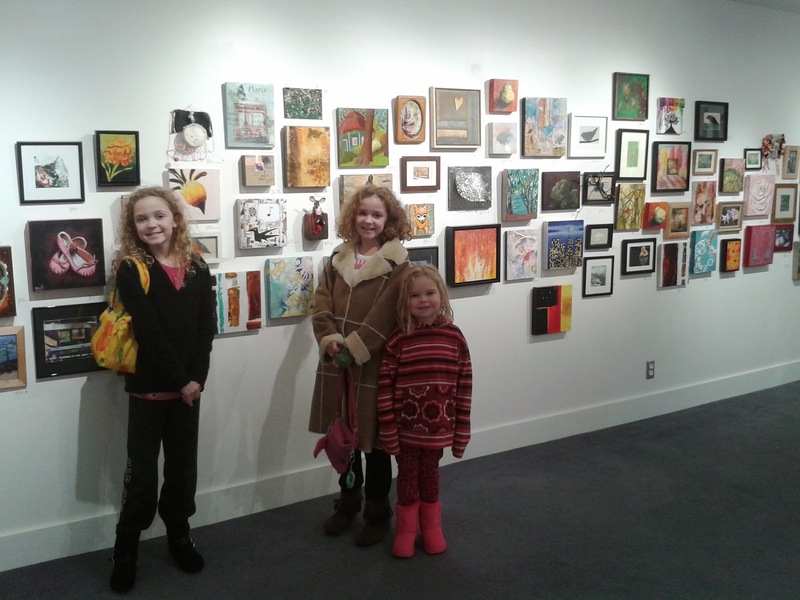 I learned about owning an art gallery – the curator was there and answered questions mom had. I heard that it can be busy and then sometimes quiet. But when a customer comes in, you can talk to them about the art, especially if you have an art show. It is not a great place to do your own art, but you can do your own art at home. The art gallery’s owner was an artist as well and she had somethings in the show. They were really pretty. 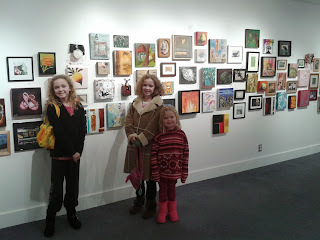 Today I went to the Metchosin Art Gallery where there was a Massively Mini Art Show on display. 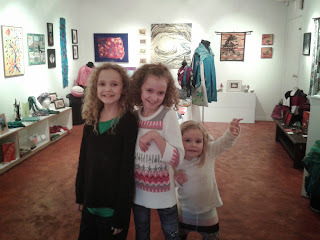 We found out about it from our friend Angie who put some of her art work in it. And she told us that it was really cool. So today we went to look at it and there was some really cool stuff there! 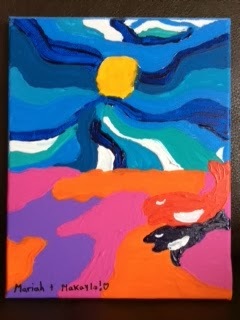 We saw a lot of mini paintings done in acrylic. I was amazed at this one artist did 5 or 6 paintings of the exact same bird with just different backgrounds – 6 times! I just couldn’t believe that – and 3 of them got bought. At first I thought “Why would someone do the same art and put it in the same gallery – make different pieces!” But I also thought “these paintings are cool”. Now, I think it’s a pretty cool idea to do the same art over again with different backgrounds because they are good at that drawing and you want to make other ones while still doing what the artist is good at. My favourite piece was Angela Menzies piece – it was a cat with a crown (in the photo - orange background and blue crown) – I really liked that one because it was really beautiful and inspiring at the same time with all the amazing colours.